Great Coffee. Just a Click Away. It all began on a beautiful sunny island surrounded by crystal-clear waters and filled with swaying palms. In 1865, Pepe Suoto began roasting and producing espresso coffee in the traditional Cuban style. He believed that the keys to a delicious cup of espresso were the highest quality coffee beans and constant attention to quality and uniform roasting. He was right. Soon after, people all over the island were enjoying his savory and aromatic coffee that had been roasted with care. Now, more than 130 years later in a different place and time, we still follow our ancestors’ philosophies. We believe that the best coffee is achieved through excellent quality beans and roasting perfection. In our state-of-the-art facility in South Florida, the fusion of technology and tradition has enabled us to bring the finest coffees in the world and the most advanced machinery together to create incredibly fabulous espresso coffee in the style of days gone by. It is this heritage of excellence that has propelled us from the sun-drenched shores of Cuba to the high-tech world of the 21-century. We have always produced and roasted some of the best espresso coffee in the world. When the Suoto family first began in the United States, they sold coffee door-to-door out of their own cars. Through this method of selling, the family developed a very loyal group of customers from all over the world. They prided themselves on friendly personal relationships with their clients. Today, we still feel very strongly about close relationships with our customers. To us it is a vital part of our business. For this reason, we decided to launch Java Cabana. Now we can sell door-to-door, like our founders did, with the help of the Internet. You can get great coffee direct from our roaster in just a few days. Not only can we sell online, but also we can build and strengthen customer relations through our site. Great coffee, hot out of the roaster, is just a click away. We hope you enjoy our site, and we hope to pass on our tradition to you and yours! Coffee, from our family to yours. 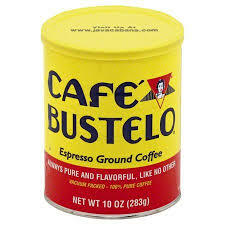 Café Bustelo is more than just coffee. 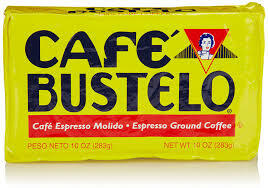 Its bold energy and rich flavor transports you into the vibrant world of Latin culture.